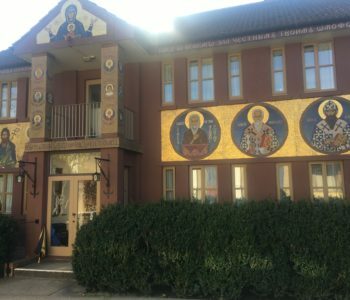 This past weekend the Church and Holy Foundation of Panagia Soumela celebrated its fifth year along the verdant rolling plots in the town of West Milford, New Jersey. 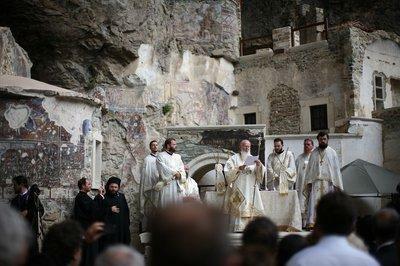 The foundation organizes the annual feast to coincide with the feast of the Assumption in honor of the sacred icon of the Panagia Soumela in Soumela monastery located in modern day northern Turkey. 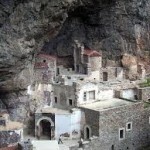 The icon and the series of events connecting it to the establishment of the monastery of the same name weave a miraculous story of wonder, faith, and national pride for the people it represents, the Pontian Greeks of Asia Minor. Only second in importance to the island of Tinos as a pilgrimage destination in Greece, the sacred monastery of Panagia Soumela in Asia Minor on the feast day of the Dormition of the Theotokos has become a national holiday for the Pontian Greeks. Here is the story as far as I could gather talking to those present at the Greek festival. 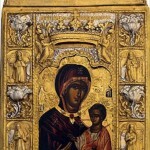 The icon bearing the image of the Theotokos and Christ Child received its birth at the hands of St. Luke the apostle, physician and iconographer. It depicts the Virgin holding the Christ Child At around the 4th century AD, during the Byzantine Period, a monastery was established along the steep cliffs of the mount Mela in the region of Macka in the Trabzon Province of modern Turkey. 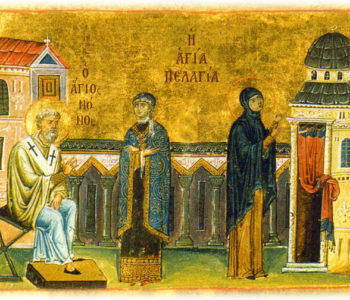 In fact, Sumela for fifteen centuries, from 385 to 1923, was the monastery-guide for the safeguarding of Greek tradition, art, history, and culture, and of religion all over the territory of the Pontus, whose inhabitants heard their own language being spoken by the apostles in Jerusalem on the day of Pentecost. 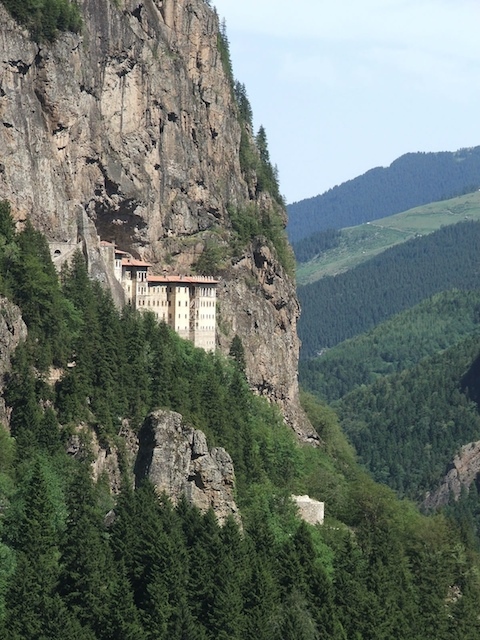 The monastery is located fifty kilometers from Trabzon, among the gorges of the Altindere (Torrent of Gold), at an elevation of nearly 4,000 feet, spanning forty meters of a long rocky outcrop of Mount Zigana, at the precipice of a deep ravine. 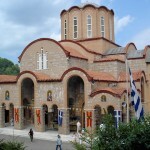 According to tradition, it was the Virgin herself who showed the place to the Athenian monks Barnabas and Sophronios, who, coming from the Chalkidiki peninsula, turned the smaller caves of the mountain into cells and the largest one into a church, displaying there the most artistic of the three icons venerated at that time in Athens and attributed to Saint Luke. The fame of the mountain shrine and of the sanctity of the two monks, who died in 412 (on the same day, tradition assures us), drew pilgrims, obtained donations, and above all summoned other monks, becoming the leading center of culture and pilgrimage in all of northeast Asia Minor. 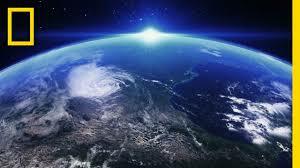 This was the land of St. 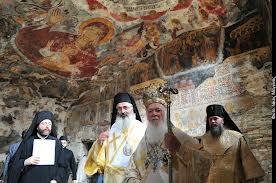 Basil, St. John Chrysostom, and thousands of saints and holy ascetics fomenting Orthodox spirituality. Even the emperor Justinian mingled among the humble people who braved the nearly inaccessible mountain, on the way back from one of his campaigns against the Persians, leaving a silver urn to house the relics of Saint Barnabas and the text of the four Gospels written on gazelle skin. The monastery gained prominence in the 13th century under Emperor Theodosius; it retained its importance even with the ebb and flow of various conquests, most notably by the Ottomans and Russians. 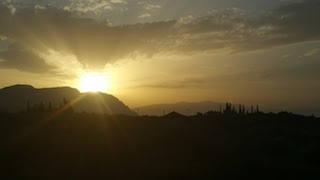 “Panàgia tu Mèlas,” the All-Holy of the Black Mountain (the name Sumela seems to be derived from a corruption of “tu Mèlas”) rose in prominence even above the shrine of Hagia Sophia in Trebizond, the glory of the city nestled on the coast of the Black Sea. 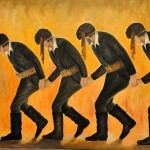 However, its turning point came in 1922 with the exchange of populations between the Greeks of Asia Minor and the Turks. The monks who were forced to flee from it at the time could not take anything with them and so buried the icon and other holy relics in a spot 150 feet far from the monastery close to the chapel of St. Barbara. 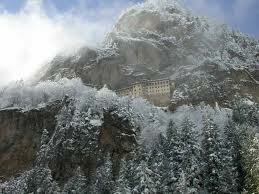 The persecuted Greeks of Asia Minor held on to the memory of their beloved mountain monastery with their exodus into mainland Greece where in their zeal they erected a second Panagia Soumela Monastery on the slopes of Mount Vermion near the town of Naousa, near Kastania, Macedonia, Greece during the 1950s. 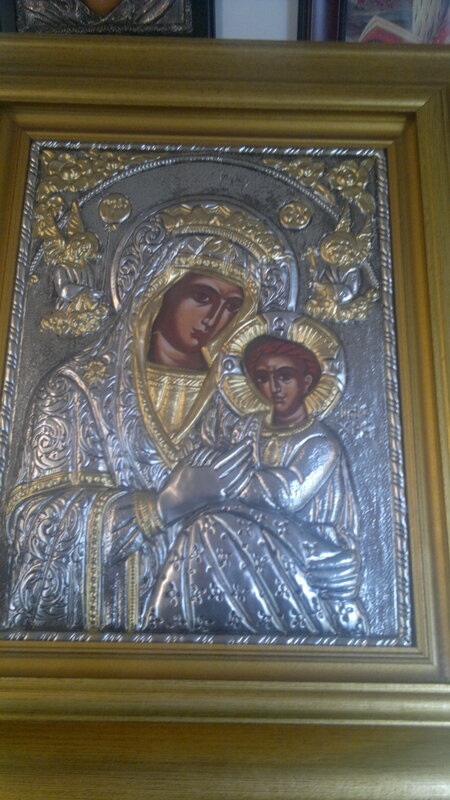 It wasn’t until 1931, on the Feast day of the Dormition of the Theotokos at Mega Spelion of Kalavryta in the Peloponnesos thanks to a chance talk between then Prime Minister Eleftherios Venezelos and Metropolitan Polycarp of Xanthe who mentioned the hidden icon of Panagia Soumela, that Venezelos made a promise that he would do anything in his power to help the Pontion people regain the icon. Then, in turn that talk led to another talk that same year between Eleftherios Venezelos and then Turkish Prime Minister Ismet Inonu who also promised to do whatever was in his power to help the Greeks retrieve the icon. And that they did. 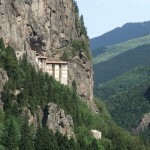 In October 1931 Father Ambrosios of the second Panagia Soumela monastery was given special permission to retrieve the icon from its hiding place. 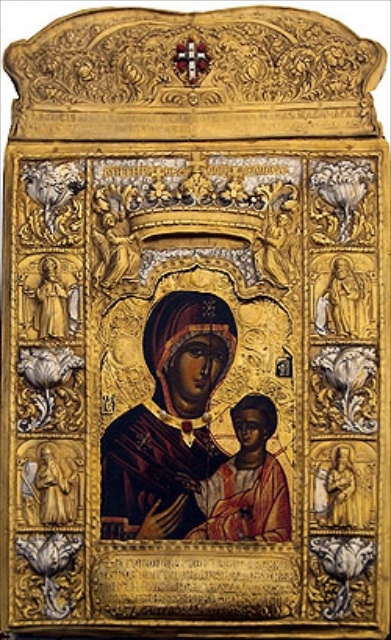 As the President of the Panagia Soumela Foundation, Mr.Vasili Vasiliou expressed, “It is a miracle that the icon after two thousand years in exile returned to Athens, its place of origin.” The icon made its way to the Benaki Museum in Athens for exhibit until 1951, again on the Feast Day of the Dormition, when it has placed in the monastery in Kastania, Macedonia. 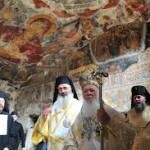 In a divine liturgy that made headlines on August 15 2010, the Ecumenical Patriarch of Constantinople Bartholomew, who had managed to get special permission from the Turkish authorities for the occasion, conducted the “Holy Eucharist” after 88 years of silence at the original monastery. 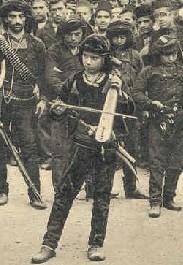 (Although some at the feast in New Jersey attested that shepherds in the area had heard heavenly singing from the abandoned site verifying that the holy site might not have been left desolate of doxology albeit from angelic and not human congregants.) 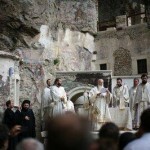 For the last four years, the Feast of the Dormition of the Theotokos has been celebrated on August 15th with only 500 visitors allowed entry for the occasion (even if the rite was realized outside the church in the ruins of the monastery and even while some 7,000 Orthodox faithful from Russia, Greece, and Syria celebrated the Eucharist.) Some conjecture the permission was given to make concessions for a young Muslim who killed a Catholic priest in Trabezon in 2006. 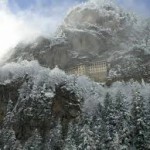 Even outside this special feast day celebration, at a height of nearly 4,000 feet, the Sumela Monastery is a major tourist attraction of the Altindere National Park. The Pontians are a rugged strain of Greeks. According to Demetra Kakoulides, a Cypriot woman married to a Pontian hailing from Russia, one of the benefactors of the Foundation, remarked, “The Pontians I liken to the Jews because they have suffered so much persecution and have lived in exile and as a result have held even tighter to their traditions and their faith.” She also mantains they were the most intelligent of all the Greeks. It seems being transplanted is part of the Pontian legacy, as witnessed by the icon and the people. 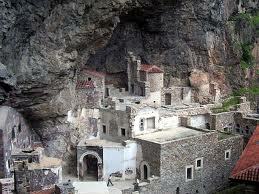 The Panagia Soumela Pontion Foundation had since 1980 been located in upstate New York near Roscoe. 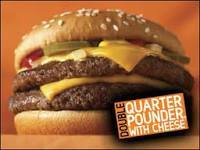 This year marks its seventh year anniversary in New Jersey. “For us , Panagia Soumela is Pontos,” Mr. Vasili Vasiliou, one of the founders and former president of the organization stated. 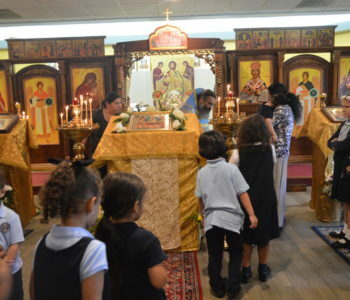 “She is the holiest of holies, the reason why we still exist as a people.” The three-day feast in New Milford was marked by a liturgy officiated by Metropolitan of New York, lots of Greek food and sweets, and of course, the characteristic folk dances and music from the region. The Foundation besides hoping to expand the current church into a more traditional design, has visions of a cultural center that will feature presentations, conferences, exhibits, and a youth summer camp. 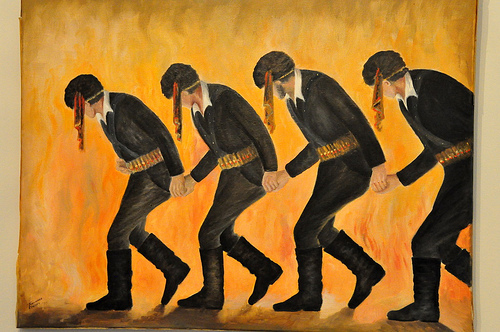 And Pontian culture is definitely different from the stereotypical Greek we have come to love. For one, the Pontians speak in a dialect that probably due to its geographic isolation more closely resembles ancient Greek. 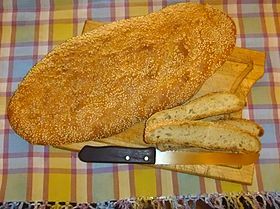 Because of their contact with neighbors around the Black Sea, Pontian cuisine is punctuated with more grains. I had the pleasure of tasting a hearty barley soup called “Shorva” made with a yogurt sauce and spiced with fresh mint (a great source of fiber and equivalent to every Greek mother’s cure-all “avgolemono” chicken soup in Pontos). 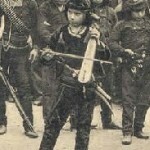 Their music played on the three-stringed lyra, also called the kemenche, is evocative of the traveling minstrels who set stories and poems to music improvising lyrics and chords just as the ancient rhapsodes did. And the dances! Even the simple ones are complex. I stood mesmerized for hours as the circles of dancers passionately swung arms up and drew them back down bowing in a frantic furious sweep of movement too detailed to describe. I learned those whose surnames end in “idis” are most probably from Pontos too. 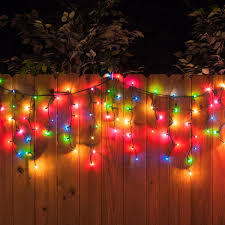 So, if the Pontians are so intelligent, rugged survivors, and builders and creators of fortunes, where do all those stupid Pontio jokes come from? “You must remember,” Dr. Haralambos Vasiliadis, the President of the Panagia Soumela Foundation and a senior environmental engineer and industrial hygienist by trade, said in response to my question, “most of those jokes were created by a Pontio.” “Because everybody knows that whenever they want to put someone smarter down , they act like the bigger guy.” He reminded me that one of the astronauts who has made it to the moon was a Russian of Pontian descent. “We have so many good Pontios,” he explained, “we cannot bring out just one as an example and say, ‘there is one good Pontio,’ One Pontio does not make the nation. It is derived from the collective good of many.” Most probably the stereotype of the “dumb Pontio” came from the inability of the mainland Greeks in the city center to decipher their unintelligible foreign accent, spawning reports of their uncouthness. 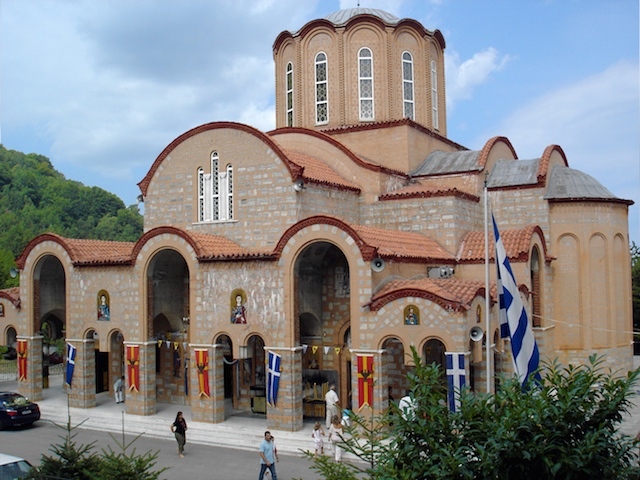 Judging from the great zeal that went into the festival and the piety of those toward the Panagia Soumela, this segment of the Greek cultural landscape will not be obliterated. Those wishing to contribute to the organization which needs to pay off the mortgage on the property should log onto www.panagiasoumela.org.